You wake up in the morning and your neck is already stiff, you know it’s going to be a bad day. Getting to work you feel as though your first headache is coming on. You tough it out until 10am then you gobble down a couple of Nurofen. Ahh relief.. the day wears on and stressful situations keep arising. You can feel the tension creeping up the back of your neck like cat with freshly sharpened claws. Looks like it’s going to be a rough night too. This is what tension headaches can be like for many sufferers. The daily grind can be extremely taxing on your overall health. Imagine how fantastic it would be to wake up feeling fresh, go to work and actually enjoy your pain free day, then go home and contribute fully to with your family and friends! This is definitely possible, all you have to do is take action and start the process of eliminating them forever. Other symptoms include may include throbbing, pain on both sides of the head, muscle pain, general tightness, dull aching in the back of the skull and limited neck mobility. The most common causes underpinning chronic tension headaches and pain in the base of the skull are often completely overlooked by most providers. Once CORRECTLY identified you can begin the process of fixing the pain and getting back your happy life! Tension headaches are most commonly related to the small muscles at the back of your skull. 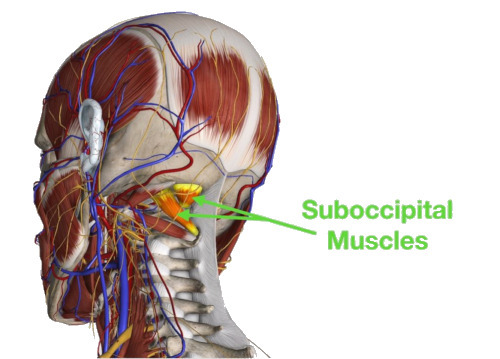 These are known as the suboccipital muscle group. These are the muscles that attach the back of your spine to the back of your skull. What’s Happening in Tension Headaches? Overworking the subocciptial muscles with poor postures is a major factor in the development of tension headaches. If you have a slouched “forward head posture” these muscles are working incredibly hard to keep your eyes looking up. Conversely, if you spend 5 minutes looking down at your mobile phone you are over-stretching the muscle group and causing more problems. Most of us do both of these things all the time! Another contributing factor is stress. This could be anything! From the mental stress of managing a large account with a fussy client at work to the fatigued stress that many new parents go through. The fact is that life is stressful and it absolutely has a direct impact on the development of tension headaches. How Can You Fix Tension Headaches? The only way to effectively fix tension headaches is to identify and correct all of these problems. We understand this and will help you correct postural issues, fix all the relevant adhesion, restore restricted neck mobility and guide you in strengthening any relevant weaknesses in your muscles.